Clean up bathroom clutter and add a stylish new design element to your bathroom with a new bathroom shelf. 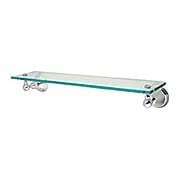 Our sturdily constructed bathroom shelves are perfect for organizing everyday items or adding decorative accents. Available in a wide variety of styles and finishes. An eclectic combination of styles make the Chesapeake collection an ideal addition to a variety of interiors. This bath shelf is constructed of solid brass, and comes in your choice of six premium tarnish and corrosion resistant finishes. 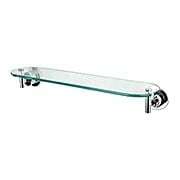 Sleek, ringed rosettes support its clear glass shelf, ideal for organizing your master or guest bathroom. With its harmonious mix of old-world style and early-American accents, the Cumberland collection brings a distinctive look to your bathroom design. This shelf is constructed of solid brass, and comes in your choice of four tarnish and corrosion-resistant finishes. 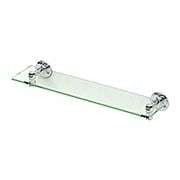 Ringed rosettes support its clear glass shelf, ideal for organizing your master or guest bathroom. With its harmonious mix of old-world style and early-American accents, the Cumberland collection brings a distinctive look to your bathroom design. This shelf is constructed of solid brass, and comes in a tarnish and corrosion-resistant polished-chrome finish. Brass and porcelain rosettes support its clear glass shelf, ideal for organizing your master or guest bathroom. Adopted from early 20th-century style, this glass shelf combines a classic silhouette and premium materials for traditional style and long-lasting wear. Constructed of solid brass, it comes in your choice of three tarnish and corrosion-resistant finishes. Versatile and understated, it's ideal for organizing your master or guest bathroom. The Potomac collection offers classic style and long-lasting performance. 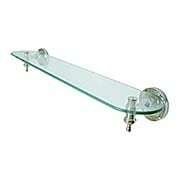 Constructed of solid brass, this bathroom shelf comes in your choice of two tarnish and corrosion-resistant finishes. Versatile and stylish, it's ideal for organizing your master or guest bathroom. The Atlantic collection offers classic style and long-lasting performance. 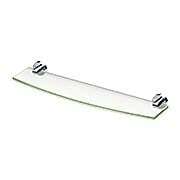 Constructed of solid brass, this durable bathroom shelf comes in your choice of tarnish and corrosion-resistant finishes. Versatile and attractive, it's ideal for organizing your master or guest bathroom. The Erie collection offers classic style and long-lasting performance. This glass shelf features ringed rosettes and delightful finials, making it an attractive addition to an array of bathroom interiors. Constructed of solid brass, it comes in your choice of four premium, tarnish and corrosion-resistant finishes. 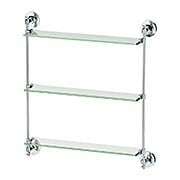 Versatile and attractive, it's ideal for organizing your master or guest bathroom. With its mix of traditional design and solid performance, the Bridgeport collection is a smart choice for an array of bath styles. Constructed of solid brass, this bath shelf comes in your choice of four premium, tarnish and corrosion-resistant finishes. Classic rosettes and delightful finials complete this fashionable accent, ideal for organizing your guest or master bath. The Dalia Glass Shelf gives you the extra space you need to organize your bathroom. Featuring a protective, solid-brass railing and tempered glass, its fully concealed mounting offers a polished look that can be installed in minutes! Manufactured by Gatco. Timeless and versatile, the Tavern Collection is always a tasteful choice. Available in an array of popular finishes, this glass shelf features understated rosettes and sturdy tempered glass. A perfect addition to today's stylish bathroom, its fully concealed mounting offers a polished look that can be installed in minutes! Manufactured by Gatco. Suited for contemporary décor, the Elevate Collection makes a bold statement. 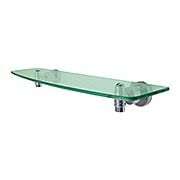 This glass shelf features a smooth, geometric lines, sturdy tempered glass, and gleaming finishes. Its fully concealed mounting offers a polished look that can be installed in minutes! Manufactured by Gatco. The minimalist design of our Latitude Collection brings a crisp, clean look to any modern bath. This glass shelf features sturdy tempered glass for long-lasting use and understated, yet stylish rosettes. Its fully concealed mounting offers a polished look that can be installed in minutes! Manufactured by Gatco. Timeless, classic style defines the Laurel Collection. 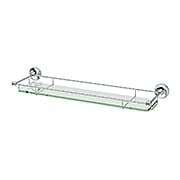 Suited for a variety of decors, this bathroom shelf features sturdy tempered glass, ringed rosettes, and a gleaming finish. 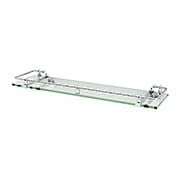 Its fully concealed mounting offers a polished look that can be installed in minutes! Manufactured by Gatco. The Dalia 3-Tier Glass Shelf gives you the extra space you need to organize your bathroom. Featuring a solid-brass frame and tempered glass, its fully concealed mounting offers a polished look that can be installed in minutes! Manufactured by Gatco. The sleek silhouette of the Sobe 15 3/4-Inch Frosted-Glass Shelf brings a crisp, clean look to modern bathrooms. The solid brass posts come in a array of popular finish options. 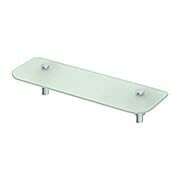 The sleek silhouette of the Sobe 27 1/2-Inch Frosted-Glass Shelf brings a crisp, clean look to modern bathrooms. The solid brass posts come in a array of popular finish options. 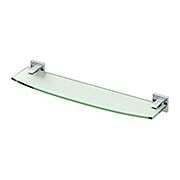 The Glam Glass Bathroom Shelf conveys modern simplicity. This sturdy design features sleek rosettes, tempered glass and shelf's minimal silhouette and gleaming finishes. 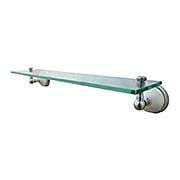 Its fully concealed mounting offers a polished look that can be installed in minutes! Manufactured by Gatco.